My Review: If I had to sum up the whole of this book in one word, I would have to use things like “Great”, “Extraordinary”, “Literate”, even “Profound”. But that’s not the impression I had at the beginning. My initial impression was that this book told a story about a kid, a chance taking, “It can’t happen to me,” life risking, adrenalin junkie adolescent who took stupid chances and finally found himself in an awful life or death situation from which there was no easy escape. That’s one take on his behavior. Ralston’s behavior, crazy as it seemed to me, was related to the pursuit of these “internal rewards”. He mentions the almost transcendent feelings he experienced in the wilderness after accomplishing some extreme goal many times throughout the book. The bare bones of the story are well known. Aron Ralston, a 27 year-old outdoorsman who pursued extreme wilderness challenges found himself deep in a narrow slot canyon in a remote area of Utah’s Canyonlands National Park, alone. A half -ton boulder shifted as he maneuvered over it and pinned his right hand between the boulder and the canyon wall. Ralston ultimately cut off his own hand to save his life. 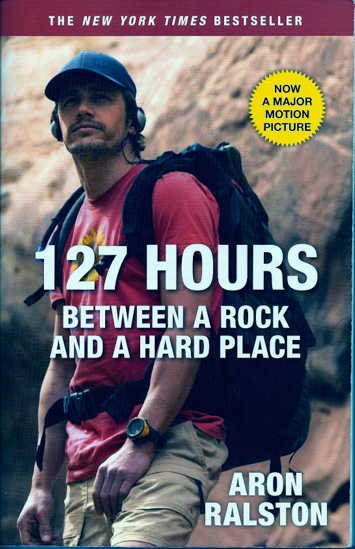 The drama in this book all focuses on what happens to Ralston physically and mentally in the 127 hours between these events, with side stories of the events that lead up to his entrapment. First impressions are not always accurate, or more precisely, they may have some accurate elements but fall short, in this case far short, of the whole picture. In this first person account, some of Ralston’s behavior seems adolescent: a focus on partying, friends and extreme challenges; a low level job that lets him lead the life of a Colorado ski bum and outdoor adventurer; many near death experiences in the wilderness (for example, almost drowning in the Colorado River, being stalked by a hungry Black Bear on an early spring mountainside, being buried in an avalanche along with two friends); and the annoying habit (at least annoying to me) of hiking to the sound of Phish on his Walkman (yes, Walkman. This incident happened in early 2003. The first iPod was introduced in late 2001). When I’m in the outdoors, I like to listen to the natural sounds around me and find plugged in music distracting and annoying. But then, I don’t spend as many hours in the wilderness as Ralston does. And Ralston seemed to have an appreciation of the fragility of life as he followed his muse into ever more risky adventures. I began to appreciate Ralston more when I learned that he was an accomplished pianist. That he has close and loving relationships with his parents and sister. That he is a graduate of Carnegie Mellon University with a degree in Industrial Engineering. That he is well read in literature and philosophy and an excellent writer. That he worked for six years as an engineer at Intel. That he had a wide circle of friends, and that he made a conscious decision to “retire” from Intel so that could pursue his passion for the outdoors more fully. This looks like a much more complex person than my first impression allowed. About a third of the way through the book, it becomes a real page-turner. Ralston is able to present the most realistic depiction of the mental and physical struggle to survive against impossible odds I have ever read. His descriptions exceed even those of Joe Simpson in that other masterful survival tale, Touching the Void. And along with everything else, this is a textbook account of how a survivor behaves. But unlike so many other survival stories, this one includes all the mental and physical challenges the survivor faced while straining to maintain some control of his fate, never fully giving up. His prose is superb. So much so that I was with him in that claustrophobic slot canyon while he evaluated his options for escape and survival. I shared his most graphic and realistic description of the day-by-day process of dying from lack of water. I was with him as he made the rational decision to stockpile his own urine to stave off the inevitable death that would come from dehydration, and I experienced the mental and physical reaction he experienced when he needed to drink it. I was there when he first explored amputating his hand and felt the mental revulsion and retching sickness in his stomach as he rejected this alternative. I felt him let go and give in to his inevitable death, hallucinating and seeing visions of his past and future, all the while evaluating his chances for rescue. He expected to be dead after the third day from lack of water. He was sleep deprived, hypothermic, dehydrated and hallucinating. This passage describes his repeated travel from hallucinogenic sleep to hypothermic wakefulness. My god, what an image. As I said, the man can write. Ralston had lost almost forty pounds. But even in this near death state his will to survive was still present. As his fifth day of entrapment dawned, a chance move showed that his hand was dead and decaying behind the rock. Amputation now seemed like a more reasonable alternative. He knew that the hand was gone, but his dull multi-tool knife blade would not be able to cut through his arm bones and free him from his trap. For the first time it occurred to him that he could break the bones in his arm and cut through the flesh to free himself. The detailed, dispassionate description of his self-amputation of the hand is both dreadful and awe inspiring. In the end, I really liked this book. I couldn’t put it down. The book is extremely well written, and very literate, which was a surprise. This is Ralston’s first book and it was not ghost written. I will look forward to seeing if he can write more good books without nearly killing himself to get the material. And that last statement kind of sums my ambivalence about Ralston himself. Though I like him better now that when I began reading the book, I’m not sure I would want him as a friend, or would want to hang out with him. I admire his passion and drive, and respect his ability to maintain some level of rational thought and action within situations where it would be very easy to panic or freeze and do nothing. I envy his relationships with his parents, sister and friends. And I fear that he will kill himself on one of these adventures. That would be a shame, especially if it happens before he has a chance to write again. Yet if it happens, he’ll have had quite a ride and he’ll go out doing what he loves.